The historically-inclined Mrs. E. and I are watching a wonderful miniseries done for BBC in the 1970s. 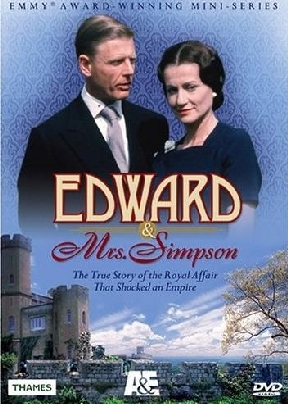 “Edward and Mrs. Simpson,” starring Edward Fox as the Prince of Wales (and later King Edward VIII) and Cynthia Harris as Wallis Warfield Simpson. I chose the series because it concerns a period that interests me greatly (Between the Wars); and frankly, for the clothes. The series was recommended by a reader for its costuming, and it doesn’t disappoint. Although, I’m not sure that I would call it “costuming.” The Duke of Windsor was responsible for many of the sartorial innovations that we take for granted today. He helped popularize brown suede brogues, chalk striped suits, soft collared formal shirts, the midnight blue dinner suit, Fair Isle sweaters, and striped Breton sailor shirts, for example. “Easy and Elegant” would have been his watchwords. And it is amazing how up-to-date he looks (the women don’t fare quite as well. Ah, fashion.) Especially since the series was shot in the 70’s — a decade of sartorial Hell, to which I bore mute witness. Now admittedly, some of his riskier fashions, the plus-fours with argyle socks, clashing plaids, large checked tweeds would be difficult to pull off today. But the rest of his wardrobe may be considered a template for dressing well in casual (what we call semi-formal) clothing. And, of course, he was small — thin — at least in his youth. He made a good hangar and he cared about clothing. I understand that something like half of his autobiography (“A King’s Story”) is devoted to matters sartorial — his real strength. For another take on Windor’s fashion influence, Will at A Suitable Wardrobe referenced him a while back as a model for building a beginner’s wardrobe. Wallet permitting, I couldn’t agree more. This entry was posted in Elegantology and tagged 1930's, BBC, clothing, Elegantology, tv. Bookmark the permalink. In my days as a design assistant minion, I would fetch many a photo or inspiration and many a reference to the POW was made in my first design job. I think so much of the intrigue was the wardrobe as well as the love they had that rocked an empire. They weren’t the first you know! I am so glad to know about this DVD. My first job ever was as an auction assistant at Sotheby’s for the Duke and Duchess of Windsor sale. Can you believe I had no idea who they were before then? I have been smitten with this stylish couple ever since. Thank you–adding it to my net flix queue now. Hello BA- what a wonderful first job. In my Walter Mitty moments I am an expert for Christie’s… Now if only I wasn’t such a dilettante. Oh, thanks for the DVD recommendations–it’s been ages since I’ve been absorbed by a good mini-series. I’ve got a million of ’em. “The Duchess of Duke Street” was equally entertaining. That series about Edward and Wallis, well, only the other day it came to mind. Good to know it’s on DVD. The actress who played Mrs Simpson was spot on. Edward Fox is a bit hard to take: that stentorian voice coming out of such a little guy, it’s almost parody. Sounded nothing like David Windsor, but then acting is make-believe. The really cool thing was the casting of supporting characters, using stars of the 30s. Elsie Randolph as Lady Colefax, Jessie Matthews as Aunt Bessie, and so forth. These gals were musical comedy stars of that era, now “old” actresses. It lent an added dimension.